Serves 4 persons. Preparation: Peel and grind ginger and garlic together into a fine paste. Crush cinnamon, cloves and cardamom into a fine powder using a pestel & mortar = garam masala Add 2 tablespoon oil in a pan & heat. When hot, add sliced chaina (paneer)and fry lightly till it goes slightly golden on both sides. Set aside the fried chaina (Paneer). Add another tablespoon of oil to the same pan and heat again. Now add finely chopped onions and stir well till onions brown a little. Add ginger & garlic paste and sautee slightly. Then add 1 teaspoon turmeric, chilli powder, cumin and coriander powder and cook till the masala cooks well. This should take up to 7 minutes. Then add 4 teaspoons of tomato puree, mix it well with the masala. 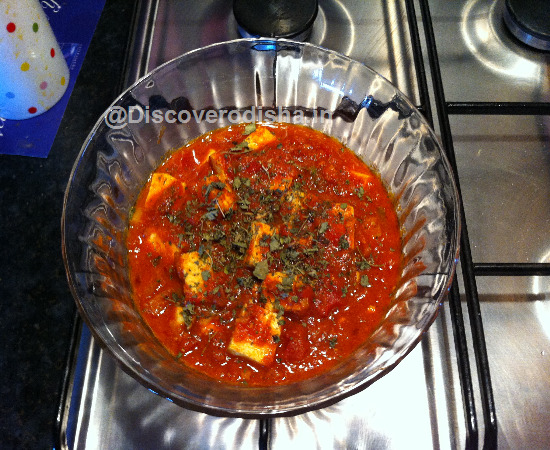 Add the fried paneer,1 teaspoon of the crushed garam masala and 2 teaspoon of salt (or to taste). Cook this for 2mins, until the oil seperates from the masala. Then add 150ml of hot water and put a dhankana (lid). Let it simmer for 7-10mins. Garnish with chopped coriander and serve it rice or chapatti.